A Kentucky Derby this intriguing, this rich in talent and mystery and potential, can only be sullied by a long introduction. Suffice it to say that horse racing undeniably has problems, big problems, but as long as it remains capable of producing horse races like this one, it will always have its place. As expected, given a 20-horse field that is knee-deep in fast young horses, the TimeformUS Pace Projector is projecting a fast pace. #8 Dortmund is shown on a clear early lead. #17 Mr. Z is alone in second place. #9 Bolo, #1 Ocho Ocho Ocho, and #10 Firing Line are side by side behind him. They are followed by #2 Carpe Diem and #18 American Pharoah. It is worth pointing out that Bob Baffert trains two of the frontrunner/presser types mentioned above (American Pharoah and Dortmund), and Ahmed Zayat owns two of them (American Pharoah and Mr Z, as well as the closer El Kabeir). So, while a speed duel could well materialize, and while there are limits to the kind of restraint jockeys can put their mounts under while simultaneously working to obtain good positions into the first turn, a self-protective dose of cynicism is probably in order. We would be quite surprised to see Mr Z ridden in a way that harms American Pharoah’s chances, and we don’t fancy the chances that the riders of both Dortmund and American Pharoah will exit the gate with designs on the early lead. Indeed, one could take this sort of thinking further by pointing out other connections and relationships and the like. And some are doing just that. But at some point we would like to stop talking about the humans and start talking about the horses–if for no other reason than that in this sport, the horses, as a rule, are quite a bit more interesting than the humans. Ocho Ocho Ocho (50-1): He drew a tough post. He’s too slow on our speed figures. He could well be compromised by a fast pace. He hasn’t been training in the best fashion. He is a toss all the way out of the superfecta for us. Carpe Diem (8-1): One of four trained by Todd Pletcher, who is not at his best at Churchill Downs (76 rating), Carpe Diem’s only disappointing effort was in the BC Juvenile, and even that resulted in a second-place finish to a freaking Texas Red. Carpe Diem ran a speed figure top of 94 as a two-year-old. His two-prep campaign as a three-year-old resulted in two 103s, which leaves him well-shy of the fastest horses in here. A very professional racehorse, tractable in a way that often leads to good trips, he drew a tricky post and will need a heady ride from Velazquez, who chose Carpe Diem over Materiality (make of that what you will, given the old saying about the best job at any racetrack: bookmaker in the jockeys’ room). Ran on the best part of the racetrack in the Blue Grass, which was not among the strongest preps (Race Rating of 101). We like his breeding for the extra distance. This colt is a contender, but only a borderline one to us, and his morning line odds are a little stingy. We like others more, and we’re not using him on top in our bets on Saturday. Materiality (12-1): Undefeated Pletcher colt makes the fourth start of his career, entering this race with a speed figure pattern of 76 91 107. One does not see this often. It bespeaks major league talent. He held off a sustained bid from Upstart in the Florida Derby. He has strong breeding for the distance. If he has any more short-term improvement in him, his opponents are in a lot of trouble. On the negative side: Again, Pletcher has not been at his best at Churchill Downs, and Pletcher horses shipping from Florida are doubly suspect at Churchill. In addition, Materiality was unraced at two. This is the much-discussed “Curse of Apollo.” Not since Apollo in 1882 has a horse who was unraced at age two gone on to win the Kentucky Derby. We care not a whit about this specific stat or about most historical Derby stats. With most stats of this sort, the curse is not on the horses. Rather, it is on the readers, who are subjected to a Curse of Prometheus and forced to have their livers pecked out by all these negative stats, most of which arise out of the ashes of randomness and survive due to nothing more than pure volume. There are simply not enough Derbies run to explode all the asinine stats as quickly as they deserve to explode. But Materiality is a little light on experience, and that does raise questions about his ability to handle what is about to be thrown at him. Nonetheless, he is a contender. Tencendur (30-1): He was progressing nicely enough, working his way into the low 90s while splitting the field in Grade 3s, and then he finally saw a dry track in the Wood Memorial and he exploded to a 102. Moreover, he did so while not receiving the easiest of trips. Being sworn enemies of promiscuous declarations about cause and effect, we are not about to attribute the improvement to the dry racetrack, but we aren’t about to rule that out, either. In any event, Tencendur has questionable breeding for the 10 furlongs and he has yet to take his game outside of New York, but that last number makes him a player in here for a solid trainer who gets an 84 rating with circuit-switchers. The Wood received a TimeformUS Race Rating of 104, stamping it as one of the strongest of the Derby Preps. At a big price, Tencendur will remain in our exotic mix, albeit only for the lower holes. Danzig Moon (30-1): Still eligible for a nw2, he exploded to a 15-point new top while no match for Carpe Diem in the Blue Grass. Still, that new top was only a 98, and he earned it while racing over the best part of the racetrack that day at Keeneland. He has reportedly been thriving at Churchill Downs, and his running style would be flattered by a fast pace. He is an improving colt who will be a huge price and we will keep him in the mix while limiting him to the bottom of trifectas and superfectas. Mubtaahij (20-1): This Irish-bred colt generated a lot of enthusiasm with his performance in the Group 2 United Arab Emirates Derby, and one look (if you can limit yourself to only one look) at the videotape of that race is all one needs to understand why. Visually, it was an impressive performance. Yes, he received a perfect trip. But the sight of this colt gliding along, biding his time on the rail while brimming with energy, and then being let loose ever so gently–let loose to lay waste to his hopelessly overmatched opponents–it is rather hard to get out of one’s head. Mubtaahij is in the care of a world-class trainer who does not send horses to the United States unless he means business. This colt has twice won at the Preakness distance of a mile and 3/16. He has beaten older horses. He has handled a Dubai dirt track that has been compared to Churchill Downs. He gives every indication that he wants to run every yard of the Derby distance. Yes, he will be racing without Lasix, but we don’t care about that. Whatever our faults, a conceit that we should be training Michael de Kock’s horses for him does not number among them. There is quite a bit to like about this colt, but we find it substantially outweighed by what we don’t like: Clearing the hurdles from Dubai to Louisville can take a toll. Landing in Louisville in 2015, to take on THIS group of American horses, is unfortunate timing. And, most important, we don’t think Mubtaahij is fast enough to beat the best of his opponents today. We just finished fine-tuning our speed figure scale to ensure its continued compatibility with Timeform London’s overseas figures. We took a particularly close look at Dubai, where the samples are relatively small and every additional piece of evidence counts. We adjusted our scale based on the newest evidence. And we concluded that Mubtaahij’s UAE Derby is 12 points (just over nine lengths at today’s distance) slower than Dortmund’s SA Derby, seven points slower than Firing Line’s Sunland Derby, and nine points slower than American Pharoah’s Arkansas Derby. To us, asking Mubtaahij to make up this gap on his opponents’ home continent is asking too much. Way too much. And if he does make up the gap and win this race? Well, we should all feel fortunate, even as we’re tearing up tickets, because it would mean we got to witness a performance for the ages. 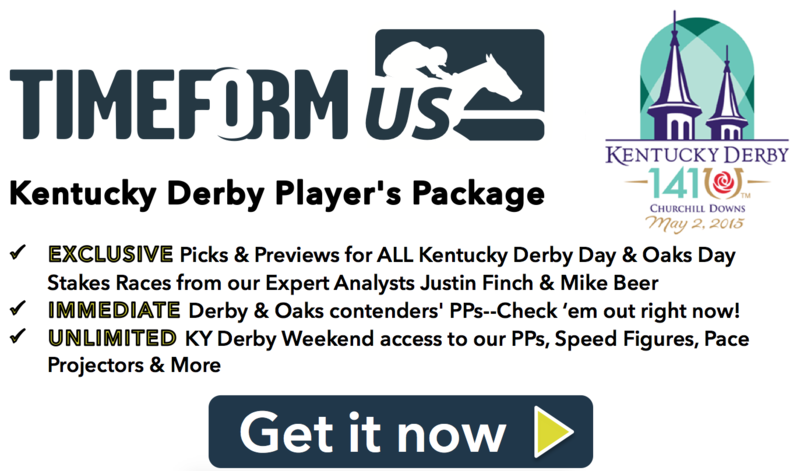 El Kabeir (30-1): In his Kentucky Derby Prep trip notes available exclusively in our Kentucky Derby Package, our colleague Mike Beer called El Kabeir’s Wood effort “a useful prep,” and we agree. El Kabeir had already secured a spot in the Kentucky Derby, and his Wood performance seemed faintly odd in the way that performances so often seem faintly odd when one of the performers has a different goal than the other performers. El Kabeir had been banging away without a break since the summer of 2014, and our suspicion is that his connections wanted to avoid having another hard race a month before the Derby. If so, that mission was accomplished. Accomplishing the next mission, however, will entail a more ambitious approach. And on our data, El Kabeir is not yet fast enough to win this stacked-deck of a Kentucky Derby. Combine this with the fact that he is relatively heavily raced and has a flat pattern of speed figures and you get a horse who to our mind has a low ceiling on his near-term potential improvement. We will confine El Kabeir to the bottom of exotics. Dortmund (3-1): This physically imposing colt is a racehorse through and through. 6 for 6 lifetime, he has won on the lead and from behind. He has won a Santa Anita sprint, a Churchill Downs one-turn mile, a Los Alamitos route, and a Santa Anita route. He has won when he looked beaten. He has won in four shoes and three. He has run the fastest TimeformUS Speed Figure of any horse in this field. He has also run the second-fastest TimeformUS Speed Figure of any horse in this field. Sired by Big Brown, who himself won the Derby and did so in chillingly impressive fashion, and trained by Bob Baffert, who has won this race three times and could easily have won it a couple more times, Dortmund’s qualifications to win this race are unmatched in this field. Our biggest concern here, by far, is the pace. He has won his last three races on or near the early lead, and the early lead may be a treacherous place to be in this Derby. As much as we love the quality of the field assembled for this race, we are not yet prepared to compare any of these horses to Seattle Slew (watch his Derby on Youtube). Winning the Kentucky Derby in the face of a punitive pace is a feat worthy of only the very best. Our hope is that Dortmund will revert to rating tactics today. We were ceaselessly impressed with him on the grass. The visual impression we got from his turf races was that he would become a champion on grass. Well, he has made the transition to dirt and improved on his speed figures in the process. That is no small feat. There is a sort of physical law at work in horse racing that works against horses who seem capable of becoming exceptional on multiple surfaces. Flying too close to the sun seldom ends well. There are so many subtleties that thwart horses in the attempt. In Bolo’s case, he is not yet exceptional on either surface. Winning a graded stake would be a start. But he is a genuine talent. He put a brief scare into Dortmund in the San Felipe, earning a figure of 102 despite a difficult trip. Then he jumped to a 105 while Dortmund dusted him with his own 112. Bolo remains lightly raced. He has a pattern of speed figures that it would be hard to improve upon. But, speed figures notwithstanding, visually, we like him more on grass than we do on dirt, and the 2015 Kentucky Derby does not strike us as a race that is open to being won by a horse who is running on only his second-best surface. Be that as it may, given his 30-1 ML odds, his talent, his first-rate trainer, and his potent distance breeding, we consider Bolo a must-use in our bets. Firing Line (12-1): Our only real knock on him is that his breeding for this distance is questionable. He’s fast (top TimeformUS Speed Figure of 110). He has a nice pattern of figures. He has twice gone toe to toe with Dortmund and given a great account of himself. He can be rated. He has reportedly looked splendid in the mornings. He has a rider, Gary Stevens, who is as smart as riders get. His trainer, Simon Callaghan, is not our favorite trainer for all types of situations, but he has handled this horse expertly. Firing Line drew a good post and is a strong contender. Stanford (30-1): Off his best effort he is seven points slower than Ocho Ocho Ocho. That is not encouraging. He benefited from soft paces (note pace figures and race fractions color-coded in blue) in his last two starts. He has not been seen in the best prep races. He was pummelled by Materiality in the Islamorada at Gulfstream. Unless he runs much faster early than ever before, he figures to be coming from well behind today for the first time. He is not particularly well bred for this distance. His trainer underachieves at Churchill Downs. Stanford is a toss all the way out of the superfecta for us–and a rumored scratch as of this writing. International Star (20-1): We really enjoy watching this colt’s races. Thoroughly professional and seemingly very athletic, he beats horses to spots and works out good trips and makes the most of his ability.The problem with him, as we see it, is that he doesn’t have all that much ability. He swept the uninspiring Fair Grounds prep races while running no speed figure higher than a 94. He doesn’t have great breeding for the extra distance. This field is full of tigers. It is going to take a lot more than he has had to offer so far for him to pull off the upset. But he does so many things right that we will keep him in the mix on the bottom of trifectas and superfectas. Itsaknockout: (30-1): It would indeed be a knockout for us if this colt were to find his way into the superfecta. Keen Ice (50-1): We loved his sire, Curlin, but Keen Ice is way too slow and does not interest us in the least. Frosted (15-1): McLaughlin colt shows a steady pattern of advancement. He worked his way up to a two-year-old top of 90. He came out at age three and ran a pair of 95s in Florida. In the Fountain of Youth, he looked every bit like a winner before he stopped suddenly. Then he had throat surgery to correct a problem. Then he went to Aqueduct for the Wood and earned a speed figure of 104 in an effort that ranks near the top of our visual highlights of the 2015 prep season. By Tapit, his breeding for the distance is sound. His trainer is top of the line. This colt has a pleasing style for a race that threatens to be run at a destructive pace. He is a strong contender at a price. War Story (50-1): Making a case for International Star was hard enough. Making a case for a horse who lost to International Star three times in a row would place excessive demands on our creativity. He is a toss all the way out of the superfecta for us. Mr Z (50-1): We admire this colt’s durability. We just wish his trainer didn’t feel the need to flaunt it so often. Mr Z is more talented than most of the other horses we are leaving out entirely, but given the way he has been raced, and given his likely involvement in a fast pace, we have a hard time seeing him producing the kind of improvement he would need here. He is a complete toss for us. Since providing us with what deserves to be called the very definition of an “irrelevant debut race,” American Pharoah has put on quite a show. He has gone 4 for 4, won going short and won going long, won on Polytrack, won on fast dirt, and won in the slop, won with head-shaking, “Did I just see that?” ease, and, in his final prep, won with a speed figure of 111. He won those four races (three of them Grade 1s) by a combined total of over 22 lengths, and, before, in between, and after, he recorded a series of workouts that elicited from seasoned clockers and observers the type of enthusiasm that one hears perhaps once every 25 years. And the positives do not end there. In his Arkansas Derby cakewalk, he proved that he can rate kindly and take over when asked. He is trained by Hall of Famer Bob Baffert. He is ridden by Victor Espinoza, a peerless distance rider who won this race a year ago. His raw talent? It may well be unmatched in here. His negatives? We think he has significant negatives. He had a setback in the fall. His connections have been playing catch-up. He has not been tested under trying circumstances. His two prep races this year were in Arkansas and came up soft. He may be harmed by the expected hot pace. His rider, talented as he is, has long shown a fondness for wide moves and may lose excessive ground from a wide post while under instructions to give the sort of confident, “Big Brown ride” that works only for riders who are sitting on Big Brown. The biggest negative? Well, it’s not accurate to call it a negative. It’s more along the lines of a warning. With a few exceptions, we believe that workouts are best used as indications of sharpness, not of ability. For purposes of determining ability, we are partial to what we see accomplished in battle–accomplished during horse races. To be sure, American Pharoah has accomplished plenty during his horse races, and his workouts going into the Derby are a strong indication that we will be seeing his best today. Today, his supporters will learn whether his best is sufficient. And they will learn it at short odds. Upstart (15-1): He had a beautiful speed figure pattern as a two-year-old. He worked his way up to a 94, earned in his troubled BC Juvenile. He came out at age three and immediately ran a 102. This was auspicious. Then he backed up one point, which proved to be the pause that refreshes because he followed that up with a 106 in his epic Florida Derby duel with Materiality. His breeding for this distance is not ideal. He got ill recently and was treated with antibiotics, which can have lingering effects, never positive. His TimeformUS breeding rating is faster for sprints than for routes. But he has run his race on four different racetracks and he is eligible to fire a shot here that can do a lot of damage. A contender for sure. Far Right (30-1): Overmatched on speed figures and humbled by American Pharoah in his most recent start, he has little breeding to speak of and less, even, than that for 10F. We give him essentially no chance of winning this race, but with the possibility of a pace meltdown, and with his field-best Late Pace Rating of 102, we will refrain from tossing him all the way out of the superfecta at huge odds. Frammento (50-1): A/E is a total toss for us if he gets in. Tale of Verve (50-1): He’d be a toss in a decent maiden race. Our main contenders are Dortmund, Frosted, American Pharoah, and Upstart. 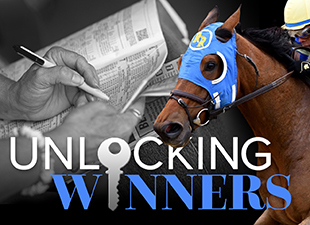 Our secondary contenders are Materiality, Bolo, and Firing Line. Our most likely winner is Dortmund. Our win bet at morning line odds is Frosted. In multi-race wagers, we will use three horses: Dortmund, Frosted, and Upstart. We will use Dortmund and Frosted to anchor our trifectas, requiring at least one of them to be in the trifecta for us to hit it. Secondary contenders will be rotated completely through the trifecta. Tencendur, Danzig Moon, Carpe Diem, El Kabeir, International Star and Far Right.